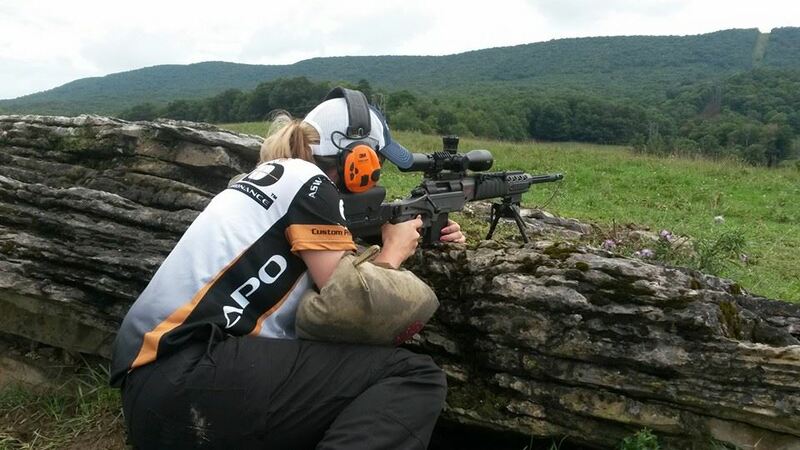 MELISSA GILLILAND > ashbury precision ordnance > For the Love of Jake…. As most you know, my prized competition rifle is named Jake. How did I come up with that name you ask? I absolutely love the State Farm commercial where the Husband is downstairs in the middle of the night talking on the phone. The Wife comes downstairs and demands to know who is talking to. The Husband says “Jake…from State Farm”. The wife grabs the phone and says “Who is this” and the Husband says “Jake…..from State Farm”. The wife asks him, “what are you wearing Jake…from State Farm” and he replies “Khakis”. The wife hands the phone back to the Husband and says “Well she sounds hideous!” Not only is this one of my favorite commercials, but I wanted to be respectful to my Husband, and since I had never dated a guy named Jake, this name stuck! Jake is a custom built Ashbury Precision Ordnance (APO) 6.5 Creedmoor with a Pinnacle series fluted barrel, AAC blackout brake, Xtreme titanium action, Huber concepts single staged trigger set at 2.5 lbs all wrapped up in an APO SuperSport alloy series chassis. My optic is a Bushnell Elite XRS 4.5 x 30 with a G2 reticle, in Spuhr mounts. I have Jake outfitted with a sniper skid plate on his foreend that helps with shooting off barricades and also keeping him from getting cut and scraped. I utilize my Armageddon Gear precision rifle sling to carry Jake from stage to stage and also use my sling on different barricades and in the sitting shooting position. I keep Jake well cleaned and lubed with Froglube. I have never had any problems with Froglube and would highly recommend to everyone. It’s biodegradable so for those adventurers, I hear you can eat it and not die! 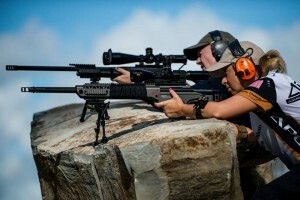 I started shooting for Ashbury Precision Ordnance last year. We worked together in fitting the best rifle for me. APO took my body size into account, as well as other measurements to make sure this rifle was “the one”. By taking my size into account, they wanted to make me a “lightweight” rifle. You see in the tactical precision rifles matches that I compete in, you are given a certain time limit to complete the course of fire and within this course of fire you are moving with your rifle. So having a lightweight rifle was paramount for me. A lot of thought went into Jake as in the type of metal to use when building him. Take for example his action. It’s made out of the lightweight metal titanium. 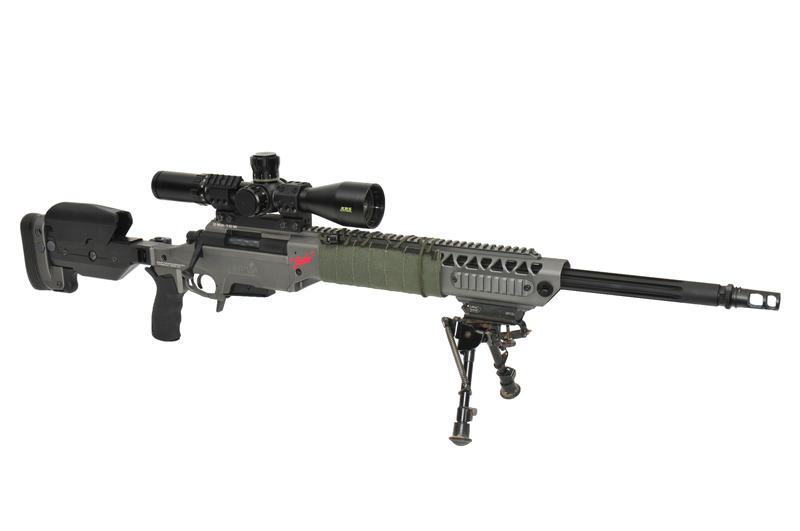 Jake’s weight, without his optics and bipod, is around 10 lbs. When you add the optics and bipod, he comes in around 13 lbs. One of the great features of this chassis is the push button system. You can adjust the shoulder stock up and down by the push of a button. This comes in extremely handy on some of the obstacles in my matches. It allows the shoulder pad to be in a comfortable position everytime you shoot no matter what you are shooting off of. This is probably my most favorite feature and one I use A LOT. Another push button feature is the adjustment of length in the stock. When I let someone shoot Jake, we adjust the length so that whoever is shooting is getting an accurate shot. The stock folds by the push of a button. Something that is also worth mentioning is the adjustment of the grip. You can move the grip forward and backward. You want this perfect so you have just the right trigger to finger alignment when breaking the trigger. Also you can adjust the angle of the grip. There are three different angles to choose from. Jake eats, well um, shoots, Hornady match grade 140 gr AMAX. I have tried other ammo, but my best groups come from this Hornady load. If it ain’t broke, why fix it? Ah hem……don’t even get me started on my Husband “breaking” Jake a few months ago. He’s gaming me you know. At 100 yrds, my rifle consistently shoots ¼ MOA. Jake is extremely accurate and I couldn’t be more proud of him. I shot this past competition season with only my Jake. He and I have had some great times and some not great times. None of it being his fault of course, I will take the blame for my mistakes. As you can see, Jake is more than just a rifle to me. This is very cliché, but he is a part of me. He has been with me from the beginning of my competition season and we’ve shared laughter, tears and a lot of traveling. I feel comfortable going into a match with him because I know how he is going shoot well. I’m the one that still gets the jitters and he’s the one that always calms me everytime the RO yells impact. It’s a great relationship. Cute story Melissa :-), after trying Jake out I am looking forward to my 6.5 that Mark is building for me which he said should be done before Christmas 🙂 !! Thank you George! That 6.5 Creedmoor is going to be a great Christmas present for you. I look forward to seeing you on the range!